In snow country there are five seasons. Spring, Summer, Fall, Winter and Mud. After the fire we thought we could start building soon. We thought maybe September. Then we thought maybe October, November, December and then we gave up. It would be spring. We have worked hard since Christmas shopping and planning and saving and scheming to hit the ground running. We are here. It is spring. If we tried to hit the ground running we would slide all the way to Arizona. Anyone who lives anywhere with any snow at all knows Mud Season. You can hear it in your mind’s ear. Squish, squilsh, swub, shwank, slop. It is slippery, slimy and cold. Mud after a rain is just mud. Mud with spring thaw is mud with cold, with winter’s left overs, and the musty smell of rotten vegetation. As the snow melts all of the winter’s tales emerge. Layer upon layer of poop, trash, and anything else that falls onto the snow become sharply revealed as the snow recedes. Mud season mud is stickier and glommier than mud in general. Each day the ground thaws a little more, melting top down toward the layer that is still frozen. Slowly the thaw gathers momentum and the water laden ground on top of the impermeable frozen earth becomes thicker and thicker until finally all of the moisture sinks into the deep layers of earth or is taken up by evaporation. Until that moment there is a gathering pool of chocolate-mud flavored pudding on each and every trail. It sticks to your shoes and makes hiking harder. Why some people pay for ankle weights is beyond me. In mud season they come for free. Sometimes your feet get so caked with mud that you have to stop and rake it off because the soles of your shoes don’t touch the ground anymore. I hear city people talk about being grounded, about finding balance in their lives, about being connected to the earth. Clearly they have never hiked in mud season. Being connected to the earth means you are raking mud of your behind as well as your shoes. Being grounded means you slipped and are now sitting on the ground in the mud. Finding your balance means you figured out how to stand up again even if you dare not take a step in the slop. There is real skill involved in hiking in mud season. Mud season is actually a misnomer. The earth surface choices range more widely this time of year compared to any other time of the year. You can walk on firm ground, snow, water, rock, bushes, left over grass with other things and, of course, mud. The time of day determines the mix. Timing is everything. Hiking early in the day or late in the day you end up with firmer terra firma than you do in the middle of the day. If you get a late start on your hike you may find yourself going up in mush and coming down on glass as the sun drops and the temperatures drop and everything freezes up again. If you get an early start you can find yourself going up in glass and coming down in mush. You have to pick the sort of mud you like best and schedule your day around your personal preferences. Personally I prefer afternoon mud. You have to work hard on your way up the trail but you are still fresh then. When you are tired and coming down the trail, the mud glazes over you can just glissade across the top only occasionally breaking through in those spots where the sun stays late in the day. The spring sunset stretches out, reveling in its new prowess, basking in in its own extended light. It stretches out in pale blues and yellows with snippets of thready clouds across the sky. It is a perfect evening backdrop. The glissade perfectly defines this elegant moment. From ballet we know that a glissade is a gliding step in which one foot slides forwards, sideways, or backwards. In mud season hiking, all feet slide forward, sideways or backward, all at once which is where the back(side)drop comes in. It is also where scraping mud off your hinnie comes in. In reality it is nearly impossible to tear your pants during mud season no matter which end ends up or which end ends down. 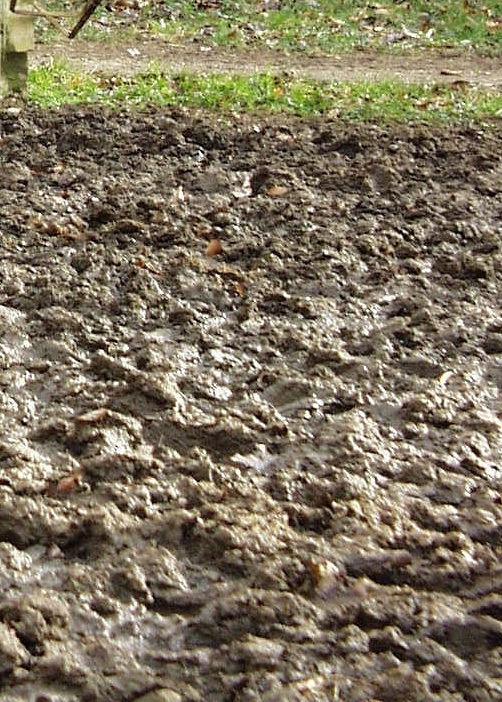 The mud has zero friction so it won’t catch or snag your clothes. Of course, it is the zero friction that got you down there in the first place. Today we managed to stay upright on our brief evening sojourn up and back down one of our favorite trails. In the summer it is puffs of dusty dirt and rock. Today it was corn snow, wet black dirt and tiny green sprouts pointing toward summer. When we headed up from the river that is a creek in the summer the left side of the trail was was glistening black mud that looked for all the world like a lava cake right after it has been cut open. On the right was a side hill of deep corn snow. Walking on the left in the molten lava cake was no only gooey, it was slippery. Walking on the snow was not as slippery but it was slushier and your feet spun out sideways because of the cant of the snow pile. As the snow melts the water runs in rivulets to the middle cutting an eroded path between the mud on the sun side of the trail and the snow on the shady side of the trail. Tonight as we alternated between surfaces looking for the firmest ground, I realized that our house was doing the same. When the foundation is poured to replace the foundation we had, it will need a firm place to settle. We will stand firm with it. We will stand firm awaiting the proper moment to race over to the foundation and put our foot and paw prints in the concrete. We are ready. We have been practicing. Concrete is just white mud.